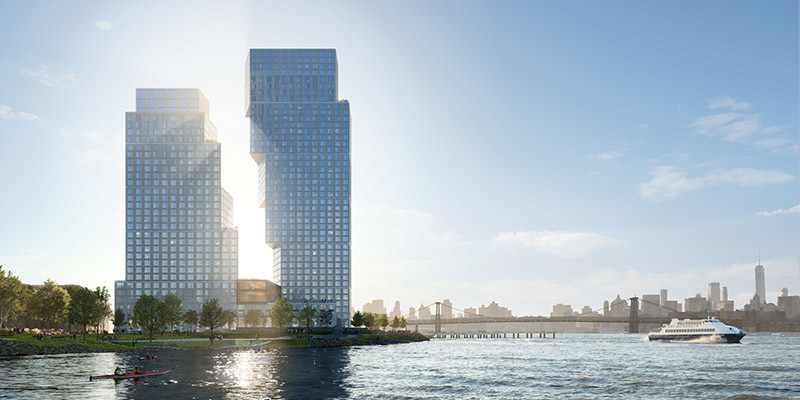 Brooklyn, NY Brookfield Properties and Park Tower Group has unveiled two new towers at Greenpoint Landing designed by OMA New York. The two towers, in conjunction with a lower seven-story building, will bring 745 units of housing—30% of which will be affordable—and an acre of new public open space to the neighborhood. This project is OMA’s first ground-up building in the borough. By extending Eagle St. and Dupont St., the towers will expand the existing public waterfront esplanade, creating a total of 2.5-acres of public open space along the shoreline, and will add 8,600 s/f of ground-floor retail to the neighborhood. The new towers were designed by Long (OMA) with project architects Yusef Ali Dennis and Christine Yoon, in collaboration with Beyer Blinder Belle (executive architect), Marmol Radziner (interior design/building landscape) and James Corner Field Operations (Waterfront Landscape). Construction is expected to begin this summer. Like two dancers, the towers simultaneously lean into and away from one another. The taller tower widens toward the east as it rises, maximizing views and creating a dramatic face to the neighborhood and beyond. Its partner steps back from the waterfront to create a series of large terraces, widening toward the ground and the new waterfront park to the North. The towers are framed by two lower volumes on the opposite corners of the site, creating a continuous edge around the block. Along this edge, subtle folds and shifts mark entries and define a smaller grain reminiscent of the often-variegated street edge conditions within Greenpoint. The towers’ facades feature precast concrete panels surrounding large windows. Like the buildings’ forms, the precast panels are carved by a series of angled planes. Oriented differently for each block—vertical, horizontal or diagonal—the carved faces react dynamically to the movement of the sun throughout the day. 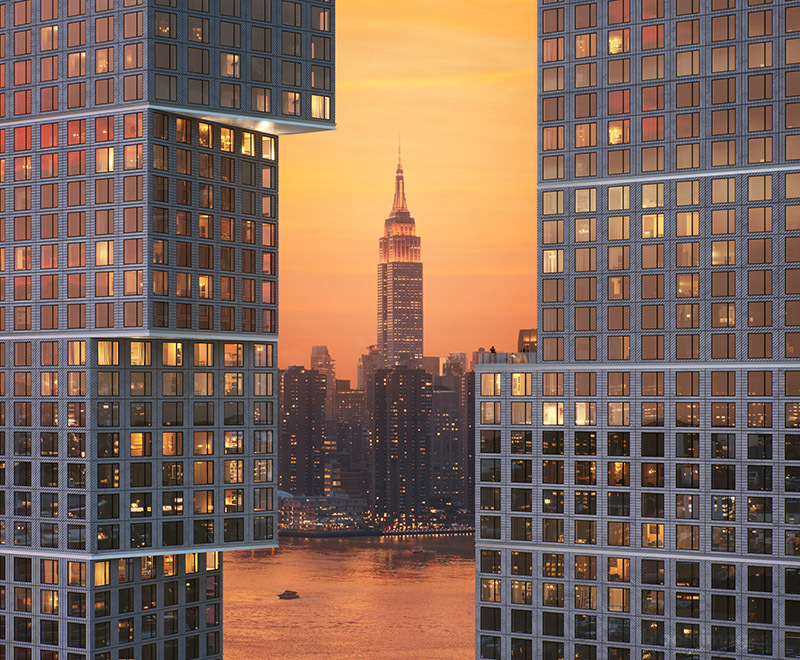 “Park Tower Group and Brookfield are bringing dynamic, cutting-edge architecture to the Brooklyn waterfront while delivering significant benefits for the Greenpoint community. The addition of much-needed housing and creation of new, accessible open space are transforming this underutilized stretch of waterfront into a new thriving, livable and sustainable addition to Greenpoint,” said Ric Clark, senior managing partner and chairman, Brookfield Property Group and Brookfield Property Partners. “These new developments with Brookfield will expand our beautiful waterfront esplanade, providing even more public open space for Greenpoint locals and visitors to enjoy, along with architecture that will define the Brooklyn skyline. With world-class landscape design by James Corner Field Operations, we are beginning to realize our transformative vision for a stretch of uninterrupted access to the Greenpoint shoreline,” said Marian Klein, president of Park Tower Group.